The rise of the superbug. A pressing contemporary issue? Or a problem dating back 80 years? Will modern medicine save us from antibiotic resistance, or will we need to save ourselves? 2016 marks the 75th anniversary of the first human trials of penicillin. As news stories announcing antibiotic apocalypses and new superbugs grow, Back from the Dead, a new special exhibition at the Museum of the History of Science at Oxford University, charts the miraculous and precarious history of penicillin from the trials in the 1940s to the present day. Limits to penicillin’s use were understood from the start. Sir Alexander Fleming, who first observed penicillin in 1928, spoke of the risk of antibiotic resistance in his 1945 Nobel Lecture, and this warning has only increased in significance today. The twentieth-century ‘golden age’ of antibiotics, which saw a proliferation of newly-created drugs, and a drop from 43% to 7% in European infection death rates, is now widely claimed to be over. The UK’s Chief Medical Officer has stated that the current era of modern medicine will collapse by 2050 if Fleming’s historical cautioning is not heeded. 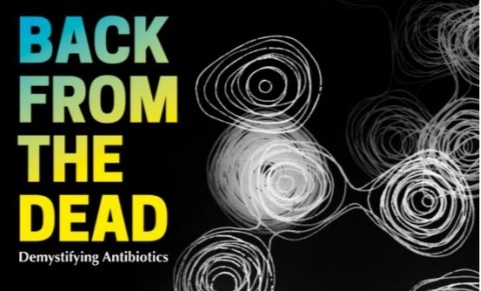 Back from the Dead will explore current responses to the challenge of antibiotic resistance. This includes a collaboration with the multi-disciplinary team of the Oxford Martin School Programme on Collective Responsibility for Infectious Disease where visitors will have an opportunity to contribute to current research on antibiotics through interactive questionnaires. The global scale of penicillin’s success in the 20th century, and the worldwide challenges that face antibiotics now, contrast with the small-scale work which led to its development. While Fleming is the name now most associated with the ‘wonder drug’, he was never able to stabilise and test his tantalising discovery. In addition to its contemporary dimension, Back from the Dead also showcases the Oxford researchers responsible for penicillin’s transformation from promise to success. An international team led by Professor Howard Florey and based at the Sir William Dunn School of Pathology in Oxford isolated the antibiotic and conducted the first clinical trials. Back from the Dead draws on the Museum’s own collections to highlight the hand-to-mouth character of research in the early days of World War II. Bed pans, biscuit tins, and cans of sheep dip were all initially used as convenient vessels in which to culture the penicillium mould. In a world of make-do-andmend, the insights of Ernest Chain, a Jewish German refugee biochemist, were balanced by the ingenuity of Norman Heatley, who conceived the temperamental apparatus by which penicillin was purified. Crucial work to determine the structure of penicillin was also carried out in Oxford, by Dorothy Crowfoot Hodgkin and a small team of x-ray crystallographers in the 1940s. Still the only British woman to receive a Nobel Prize for science, Hodgkin’s work is revealed in the exhibition both by the painstaking labour of molecular model-making and the vivid insights of her personal correspondence. The exhibition includes work of bioartist Anna Dumitriu, who creates artwork through the direct use of bacteria and has engaged internationally with issues of microbial resistance. Sponsored by the EPA Cephalosporin Fund, the Back from the Dead exhibition will be combined with an exciting programme of public events, education work and digital resources. This generous support has also allowed for the conservation of apparatus and archives in the Museum’s collections and will permit a subsequent permanent redisplay of this important material.